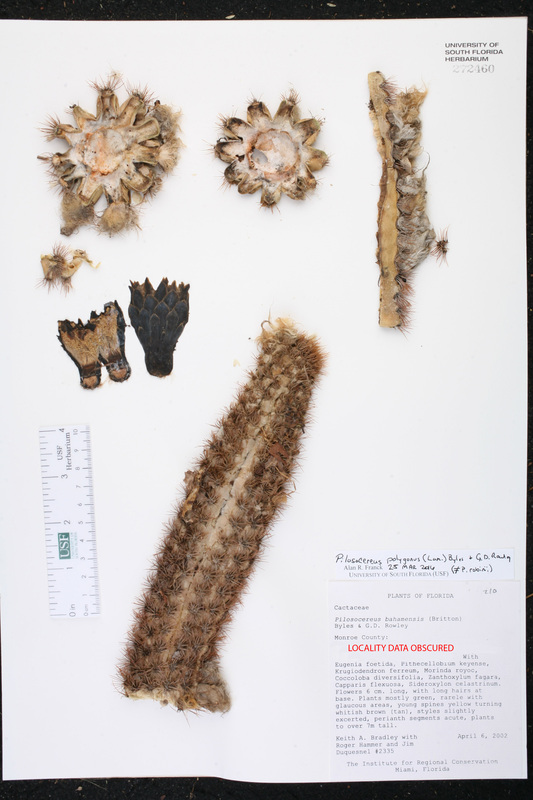 Citation PILOSOCEREUS POLYGONUS (Lamarck) Byles & G. D. Rowley, Cact. Succ. J. Gr. Brit. 19: 67. 1957. Basionym: Cactus polygonus Lamarck 1783. Type: "Santo Domingo" [Hispaniola]: Without data (lectotype: Plumier, Pl. Amer. t. 196. 1759). Lectotypified by Zappi, Pilosocereus 149. 1994. Cactus polygonus Cactus polygonus Lamarck, Encycl. 1: 539. 1783. TYPE: DOMINICAN REPUBLIC ["Santo Domingo"]: Without data (lectotype: Plumier, Pl. Amer. t. 196. 1759). Lectotypified by Zappi, Pilosocereus 149. 1994. Cephalocereus polygonus Cephalocereus polygonus (Lamarck) Britton & Rose, Contr. U.S. Natl. Herb. 12: 418. 1909. BASIONYM: Cactus polygonus Lamarck 1783. Cereus polygonus Cereus polygonus (Lamarck) de Candolle, Prodr. 3: 466. 1828. BASIONYM: Cactus polygonus Lamarck 1783. Pilocereus plumieri Pilocereus plumieri Lemaire, Rev. Hort. 1862: 427. 1862, nom. illegit. BASIONYM: Cactus polygonus Lamarck 1783. Pilocereus polygonus Pilocereus polygonus (Lamarck) K. Schumann, Gesamtbeschr. Kakt. 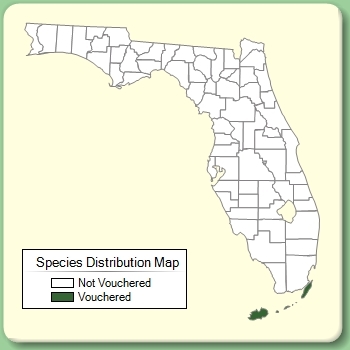 196. 1897. BASIONYM: Cactus polygonus Lamarck 1783. Cephalocereus brooksianus Cephalocereus brooksianus Britton & Rose, Torreya 12: 14. 1912. TYPE: CUBA: Oriente: Near Novaliches, ca. 6 mi. S of Guantanamo, 8 May 1907, Maxon 4512 (holotype: NY). Cephalocereus swartzii Cephalocereus swartzii (Grisebach) Britton & Rose, Contr. U.S. Natl. Herb. 12; 420. 1909. BASIONYM: Cereus swartzii Grisebach 1860. Cereus brooksianus Cereus brooksianus (Britton & Rose) Vaupel, Monatsschr. Kakteenk. 22: 66. 1912. BASIONYM: Cephalocereus brooksianus Britton & Rose 1912. Pilocereus brooksianus Pilocereus brooksianus (Britton & Rose) F. M. Knuth, in Backeberg & F. M. Knuth, Kaktus-ABC 329. 1935. BASIONYM: Cephalocereus brooksianus Britton & Rose 1912. 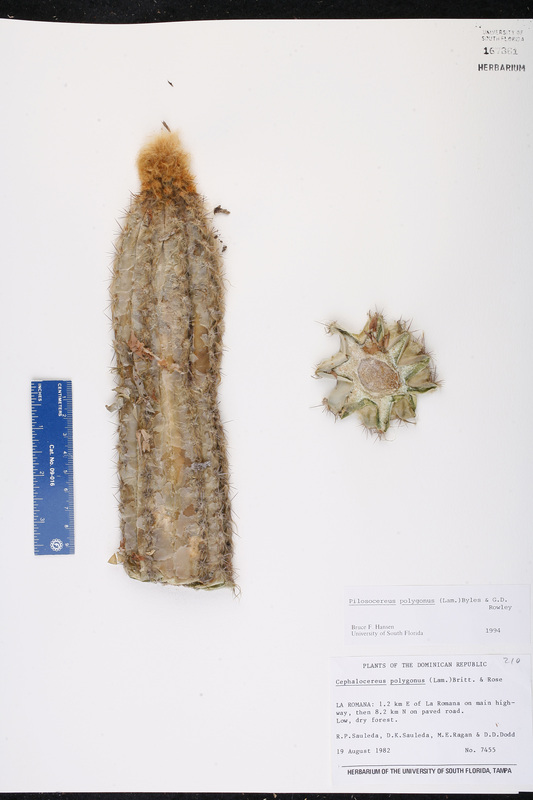 Pilosocereus brooksianus Pilosocereus brooksianus (Britton & Rose) Byles & G. D. Rowley, Cact. Succ. J. Gr. Brit. 19: 66. 1957. BASIONYM: Cephalocereus brooksianus Britton & Rose 1912. Pilosocereus swartzii Pilosolcereus swartzii (Grisebach) Byles & G. D. Rowley, Cact. Succ. J. Gr. Brit. 19: 69. 1957. BASIONYM: Cereus swartzii Grisebach 1860.